Wow, what an experience. Go out and get yourselves some wings at Buffalo Wild Wings - they truly treated us like royalty this weekend and the game did not disappoint. 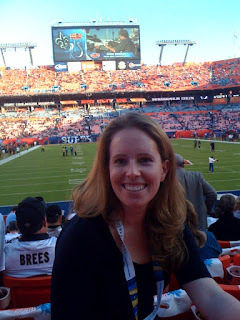 While my husband and I were clutching our faces in dismay as the interception was returned for a touchdown, and everyone surrounding us seemed to be a Saints fan (50-year-old fan in front of us literally jumped up onto the seat in front of him and a woman nearby was crying she was so happy), it was still an event that I will never forget despite the unwanted outcome. And really, I can't be all that sad that the Saints won, just bummed that the Colts didn't if that makes sense. Catch up on the highlights from yesterday including our stop by the NFL Alum pre-party sponsored by PrimeSport and of course the game itself. I have SO many photos to post but here's one of me in our amazing seats during pre-game. That is amazing. Your passion was duly rewarded. The best part of following you during all this, I think, is that you were simply competing for bragging rights...and then once winning the trip became real, it was such a huge (and welcome!) surprise to you. Sounds like that wonderful innocence come next year will be long gone, and the pressure will be on you to repeat! Although Miami is sure more fun than Big D!! Glad you got to see my Saints win their first title!!! so fabulous, ffl! thx for keeping us updated on the adventure. may there be many more to come! hope you enjoy the new job! Join in on the Winter Olympics fantasy fun! Super Bowl Day is here!